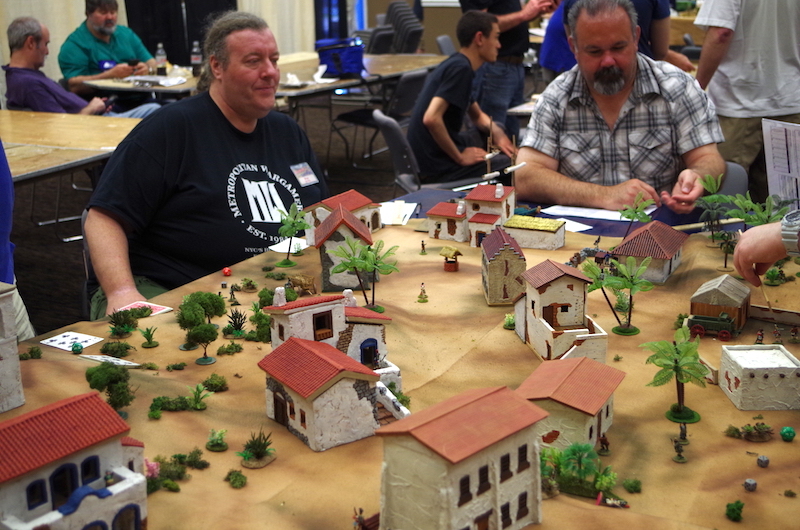 Combat Patrol Games at NJ Con 2017 | H.A.W.K.S. Several HAWKs (Duncan, Eric, Chris J., Zeb, and I) went to NJ Con (Fire in the East) this weekend to run and play some games. 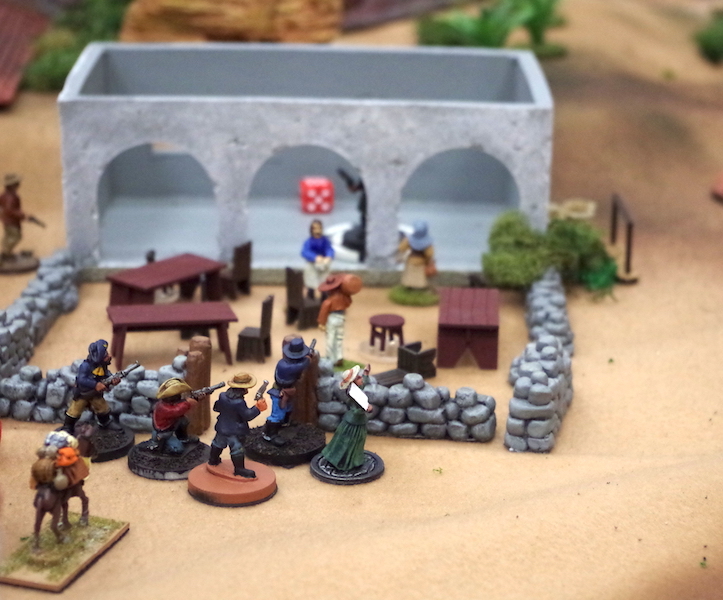 To minimize the amount of terrain we needed to carry up there, we ran a series of scenarios in different historical periods on a the same terrain, with minor changes between games. 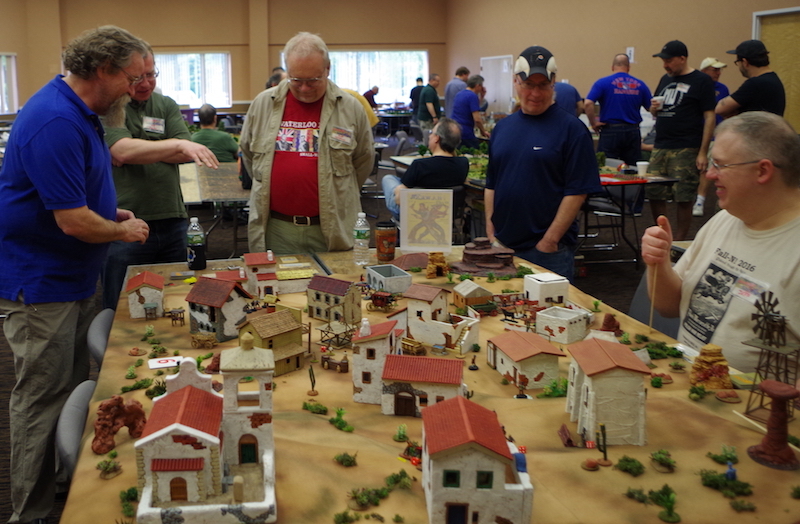 Duncan prepares to run with War of 1812 game using the Napoleonic supplement to Combat Patrol. 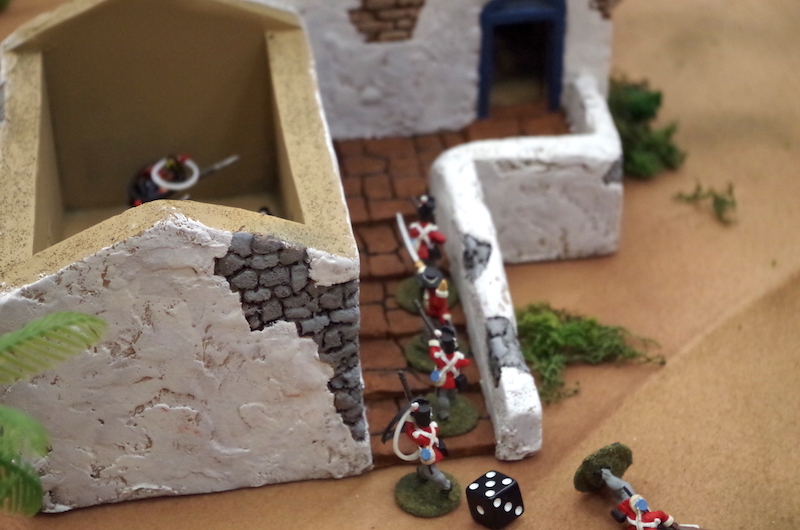 The first was a War of 1812 game using the free Napoleonic supplement to Combat Patrol™. 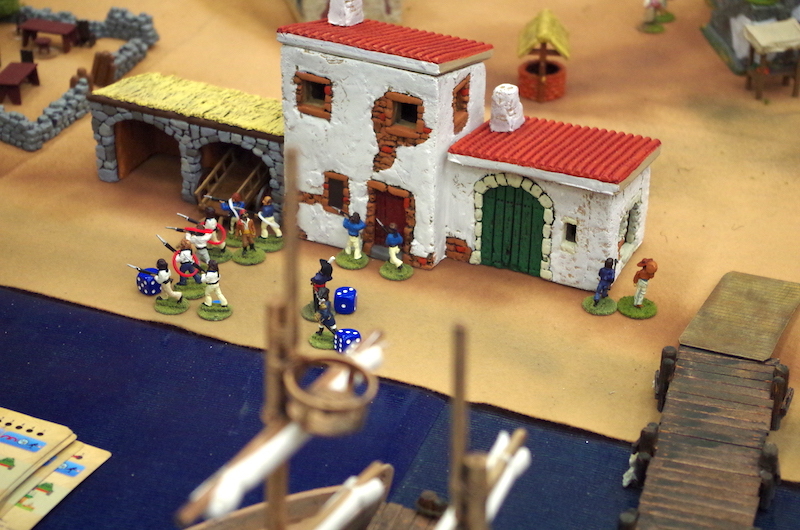 The scenario involved an American force landing in a small, British-held, port town in the Caribbean. The Americans landed in small boats and then advanced inland to destroy the British supplies. While the Americans got to the British supply room and started it on fire a couple of times, the British were able to put it out. The Americans got to this house and set up before I got there, even though I started closer to it. I charged up the stairs to try to take back the building – but that didn’t work out too well. The game was a lot of fun, and I think the scenario was pretty balanced, but in the end, the Americans left the table without successfully destroying the supplies. 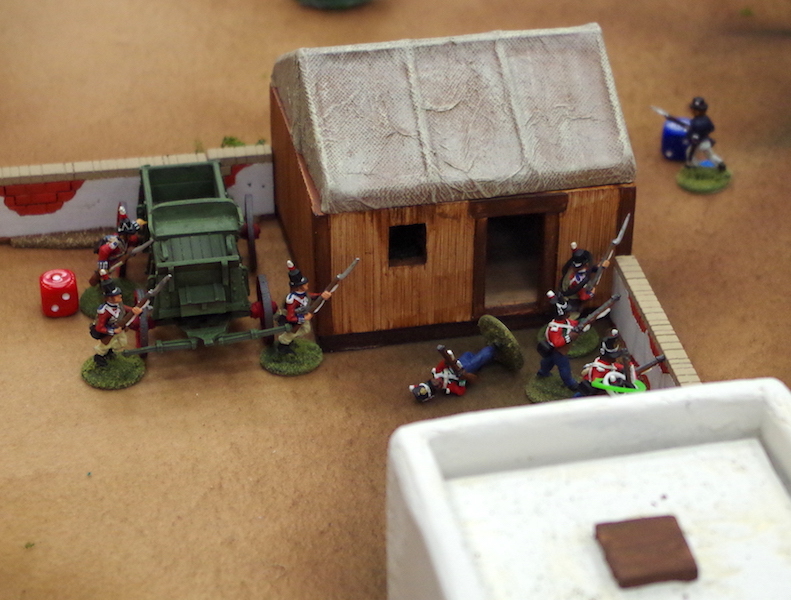 British defending the supplies, which were stored in the wooden building with canvas roof. American sailors on the beach. 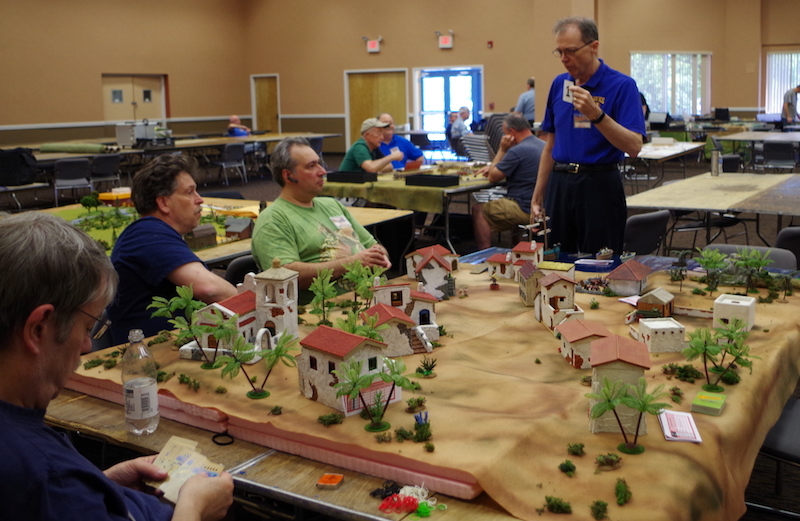 Our second game on this table was a Moro assault on an American-defended village in the Philippines. 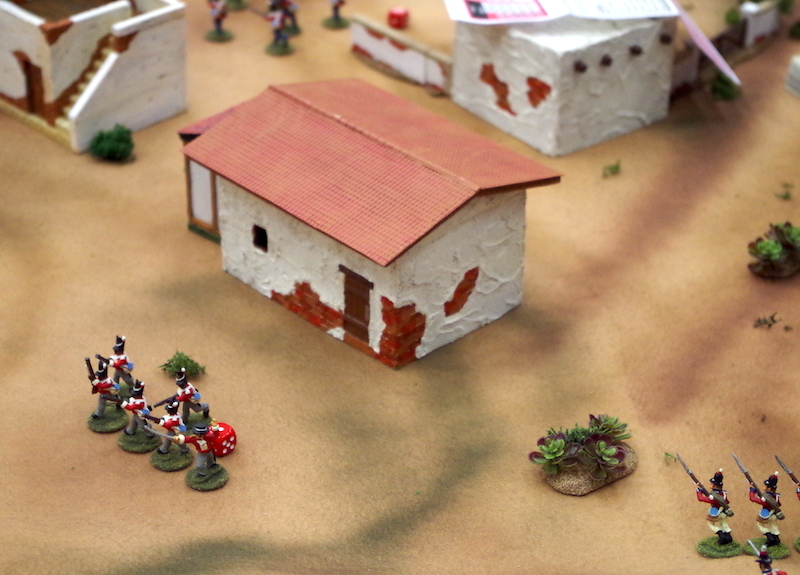 For this game, I left the terrain exactly as we had for the War of 1812 game. 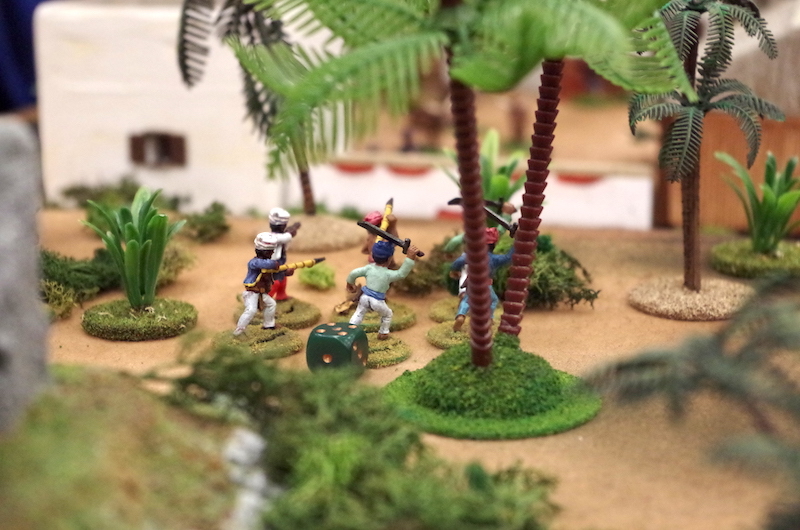 Where the Americans attacked British from the beach, the Moros attacked from the opposite edge of the table, swarming out of the jungle. The Moro game is about to begin! The Moros had to attack out of the jungle, burn the same supply hut, and capture livestock. In the lower right of the picture above, you can see that the Americans had a small field gun, but the crew was asleep in one of the buildings when the attack began. They had to rush to the gun before they could fire it. The gun was able to knock out the Moro gun by the end of the game. Moros swarmed over the village. The American force consisted of two squads of infantry, a squad of Moro Constabulary, and a squad of Filipinos. The Moros had 12 teams of infantry and a black-powder improvised gun. 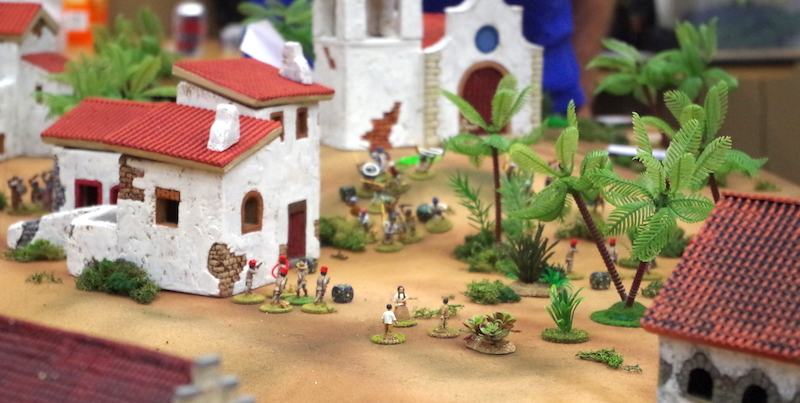 The American players felt like the Moros were swarming over them, and there were a number of nail biting moments. While Eric’s Moros got to the supply hut, they were unsuccessful in lighting the supplies on fire. 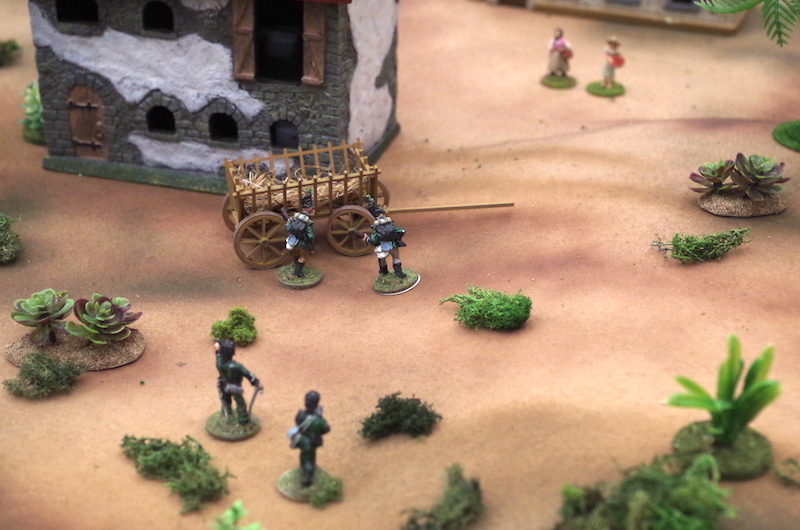 Pass of the North Moros advance out of the jungle. For this game, I used Combat Patrol™: World War II with few modifications. 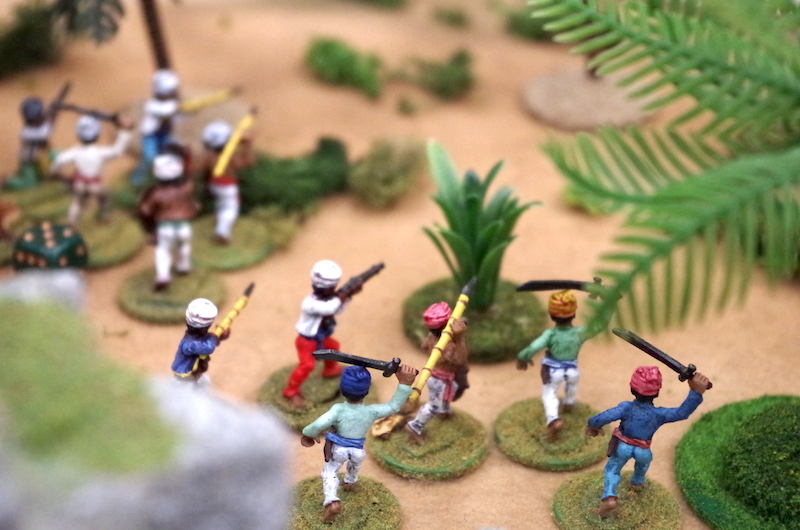 The Moros had few rifles, but they were really good in hand-to-hand combat, so the Moro players spent a lot of time trying to close with the Americans. I also gave the Moros and extra +1 in hand-to-hand when they charged with spears. The Moros generally did well in hand-to-hand combat, but there were some upside down moments when two Moros ganged up on a single American but lost the combat anyway. More Moros?! How many are there? 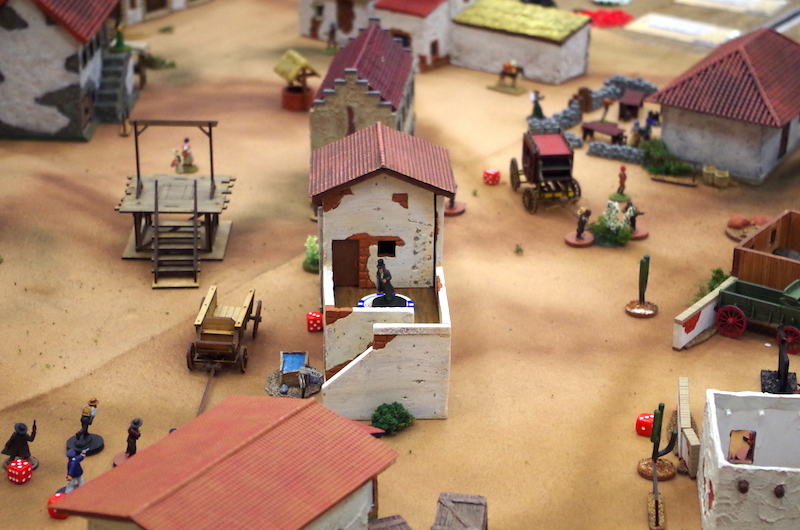 The third game was a wild west shoot-em-up using Zeb Cook’s recently-released Wild West supplement. Eric and Jeff preparing to begin the carnage. For this game we added a few more buildings, replaced the palm trees with cacti, and changed up the “set dressings.” I think the town looked convincingly southwestern. Howard Whitehouse preparing to enter the dynamite, coal oil, and whiskey storage shed! In Zeb’s town there was apparently a desperado convention being held. The figures standing on the poker chips had a price on their head equal to the value of the chip. There were four teams of bounty hunters competing to collect the most bounties. In addition, each of us had a price on our head, so there was a lot of incentive to shoot each other as well. Wild and wooly mayhem ensured. Advancing into the Cantina to gun down an outlaw – and perhaps stop for a whiskey. I think in these pictures you can see that changing up a few items made the town convincing for different historical periods. No Western town is complete without a gallows. 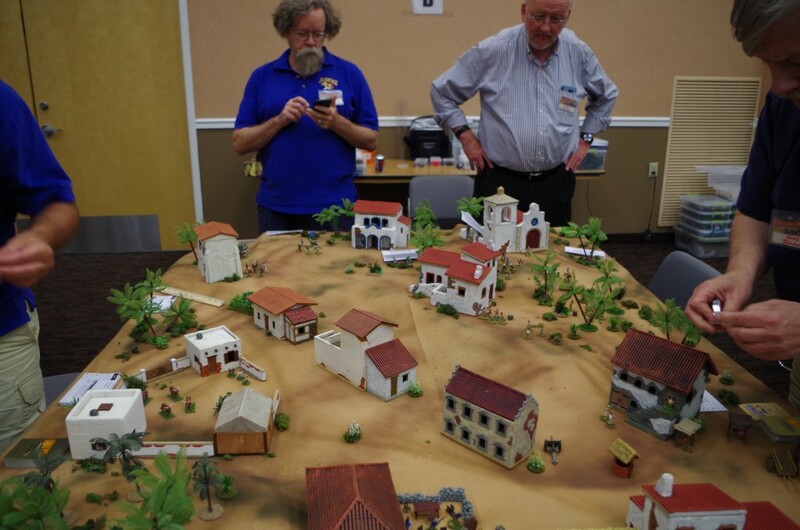 In addition to our three Combat Patrol™ games, Eric ran a Sharpe in the Peninsula game, using Blood and Swash. A memorable moment came when Harper fired his volley gun and killed both Hakeswell and Sharpe. You can see from these pictures that swapping out the cacti with some deciduous and palm trees and removing much of the wild west set dressing made the town look like the Peninsula. Nice write up Buck, looks like you had a successful con! Wish I could have attended, but other than health it was Lynn’s birthday! Anyways, love the way you used the terrain for multiple games!